This information is provided as a general guide to the area with highlighted locations related to our sport of snowmobiling. For more information about the area, please visit Positively Allegan. 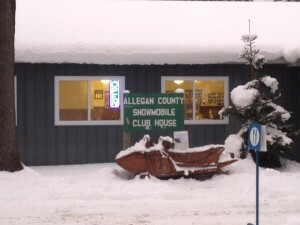 Zoom in Allegan & Hopkins for more Lodging, Gas, Food, Trail Maps & Permits, Snowmobile Rental, Sales and Repair. Beautiful B&B in the country. Huge selection of motorcycle parts & accessories. steaks & seafood, plus a pub with a fireplace. A family owned business providing the largest selection of trailer types including Race Trailers and Snowmobile Haulers,. We are the factory. There is no middleman. You get a great price on a high-quality trailer. We are a local entertainment business, offering a wide variety of rides and attractions, such as mechanical bulls, climbing walls, inflatables, laser tag and so much more.